All fields are required. No credit card information is collected. Must be a valid email address to install. All Elliott Wave Theory Rules and Guidelines are Enforced, with Warnings to Allow You to Change Your Counts - Makes it Easier to Learn Elliott Wave! Highly Customizable Chart and Trading Preferences and Much More ... Try It Now! MotiveWave Has All of the Features You Need In An Elliott Wave Trading Platform or Charting Software. 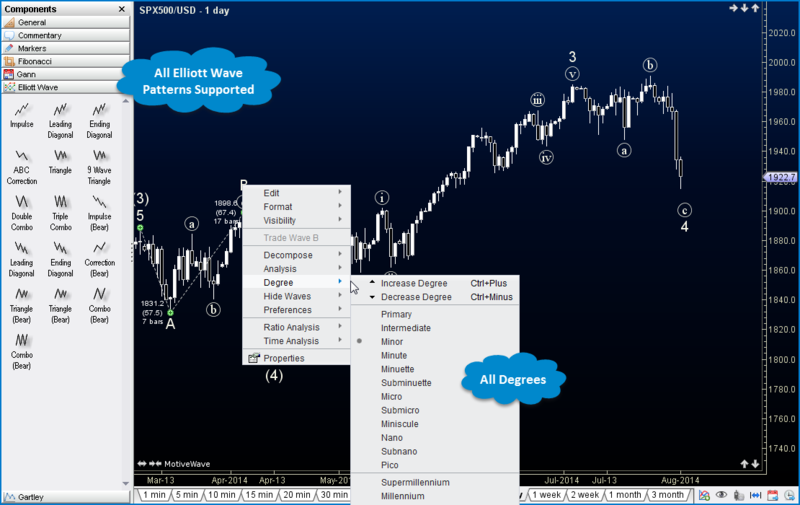 Looking for Elliott Wave charting software? 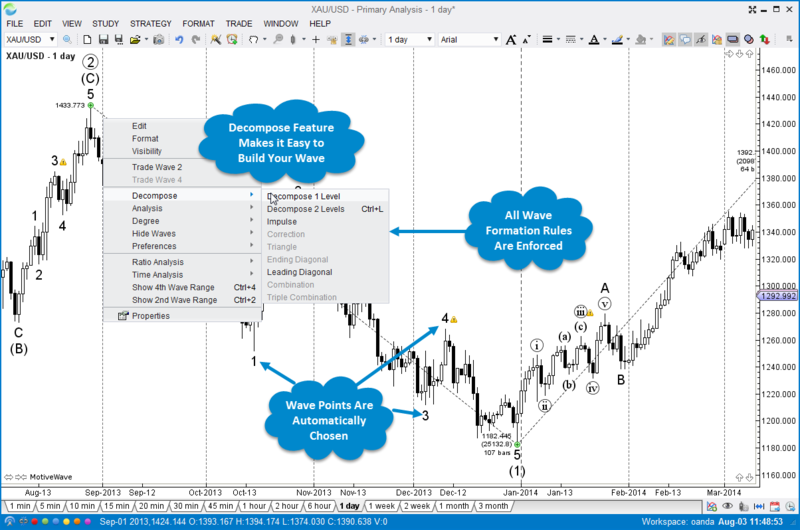 MotiveWave has the most advanced and best Elliott Wave tools, charts and commentary features available in one software package with highly customizable user preferences - no programming required. 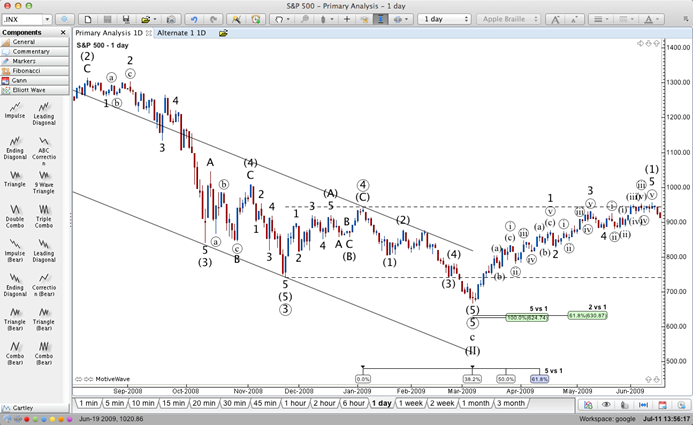 Don't forget MotiveWave also has advanced Fibonacci, Time and Ratio Analysis, Gartley and Gann strategy tools too. Looking for an Elliott Wave trading platform? MotiveWave has all of the trading features you need, including Replay Mode, DOM windows, Quote Sheets, ability to trade directly from the charts, highly customizable trading preferences and more. No more doing your Elliott Wave Analysis in one program and trading in another. 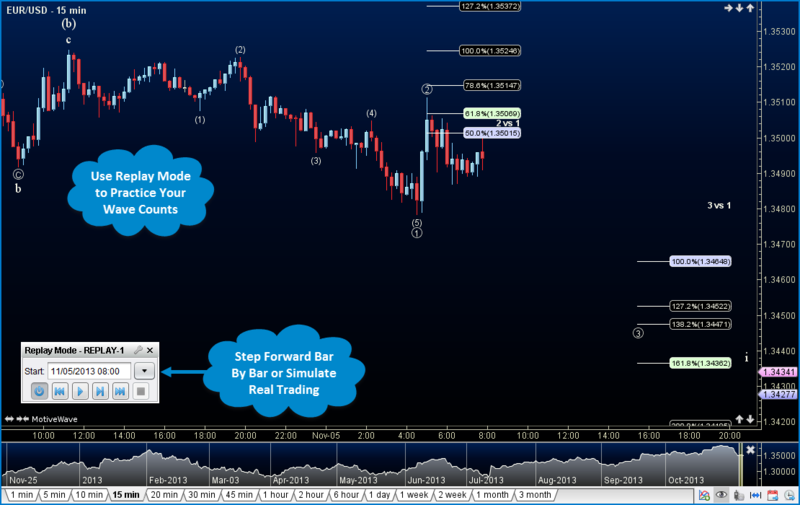 MotiveWave allows you to do your Elliott Wave Analysis and then trade directly from those charts. MotiveWave's Charting and Trading Platform Fits Your Needs and Budget. Just starting out in Elliott Wave analysis and don't need to trade? Our Charts Edition with our add-on Elliott Wave Modules will allow you to get started with Elliott Wave chart analysis at a one time cost of US$99 for the Charts Edition and a one-time cost of US$397 for our manual Elliott Wave Module. 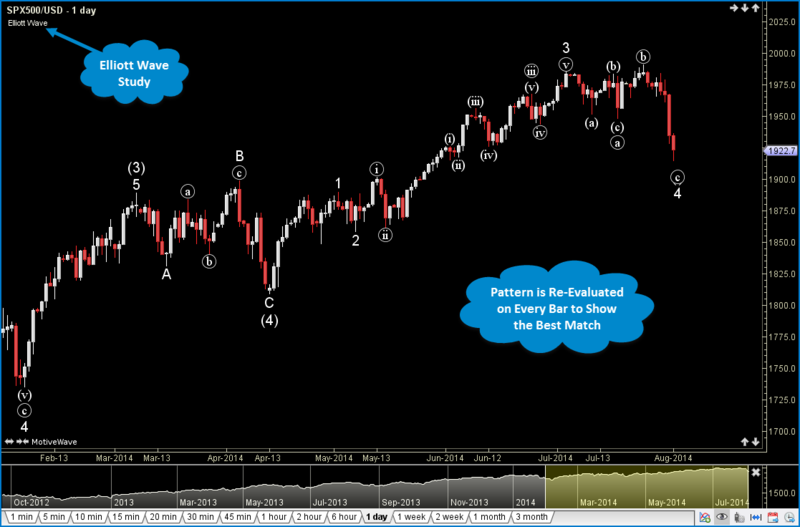 Looking to add on Auto Elliott Wave / Pattern Recognition? 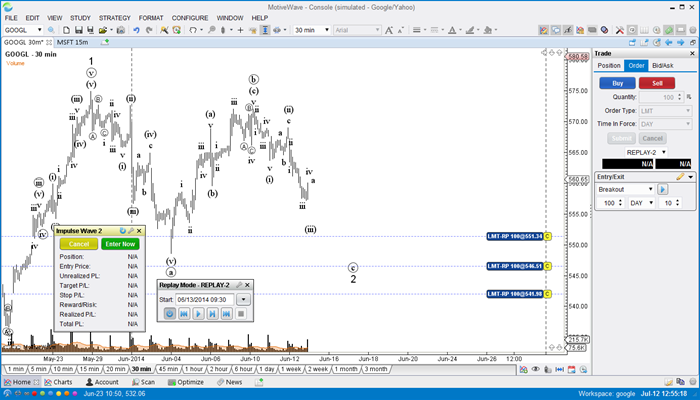 The Auto Elliott Wave Module can also be added on for US$497. If you decide you need more features along with your Elliott Wave tools, you can upgrade to the full-featured MotiveWave Ultimate Edition. Leases start at US$295 for our 90-day auto-renewing subscription. Or, if you prefer to purchase a Lifetime License, the MotiveWave Ultimate Edition is a one-time payment of US$1595. MotiveWave Does Not Charge You Extra Fees For Data. MotiveWave provides charting and trading software, not data. What MotiveWave does do is connect directly to your Data Service Provider or Broker so that you can access their data through our advanced charts and trade directly from the MotiveWave charts to your broker. The only fees you pay for data or trades are what that Broker or Data Service Provider charges for their data feed or service. What Can You Trade in MotiveWave? Because MotiveWave connects directly to your Broker, we support whatever that Broker offers. That means you can trade forex, stocks, futures, CFDs and options markets, to name a few. 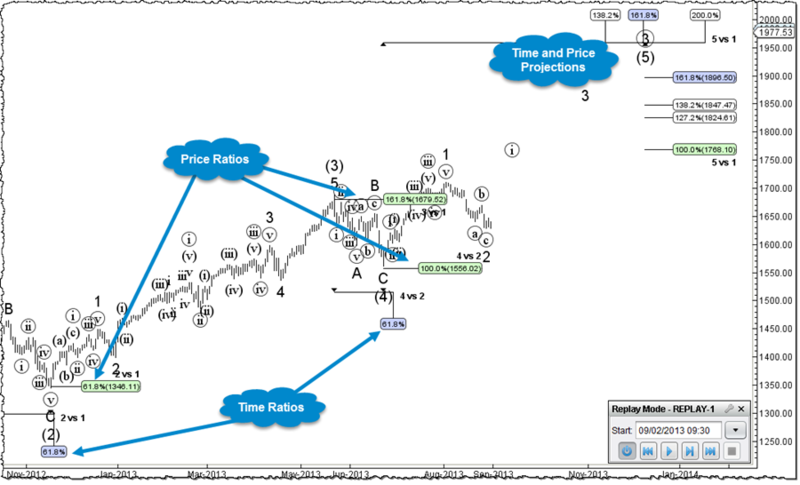 You can also use free practice, demo or simulated accounts to practice strategies including Fibonacci, Elliott Wave, Gartley and Gann with MotiveWave software. MotiveWave Lets You Use Multiple Brokers and Install On Multiple Computers At No Extra Charge*. Just Purchase Or Lease One License*. MotiveWave allows you to create a Workspace for each Broker or Data Feed you want to connect to. You can run them at the same time by opening another instance of MotiveWave on your computer. You can also install MotiveWave on more than one computer with the same license. This allows you to run MotiveWave on your work and home computers, as long as you don't need to run them at the same time. 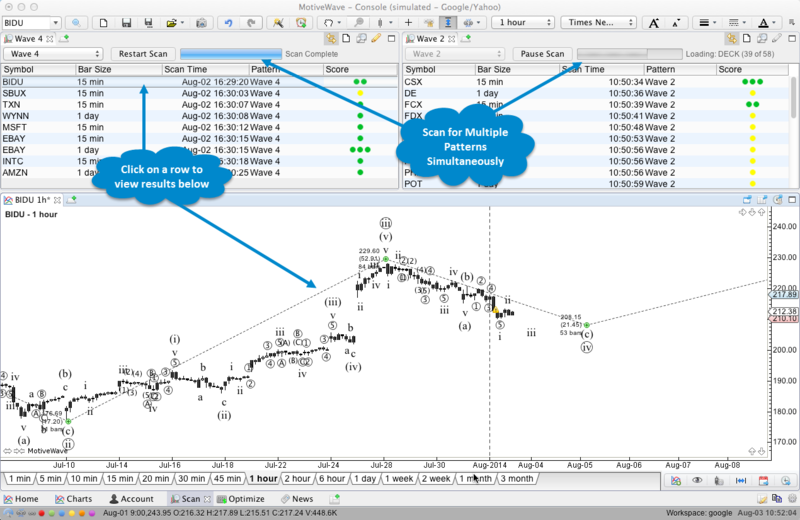 You can export and import your charts and analysis between multiple computers. *If you need to run MotiveWave on multiple computers at the same time, you will need multiple licenses. Please contact sales@motivewave.com to discuss purchasing multiple licenses.